Living in the woods near the mini-mountains, our winter fun activity is primarily skiing. Two weeks ago, MacGyver took the kids to ski for the morning and I had four hours to myself. What did I do with those four hours? Did I get a massage or a manicure? Did I go back to sleep? No. 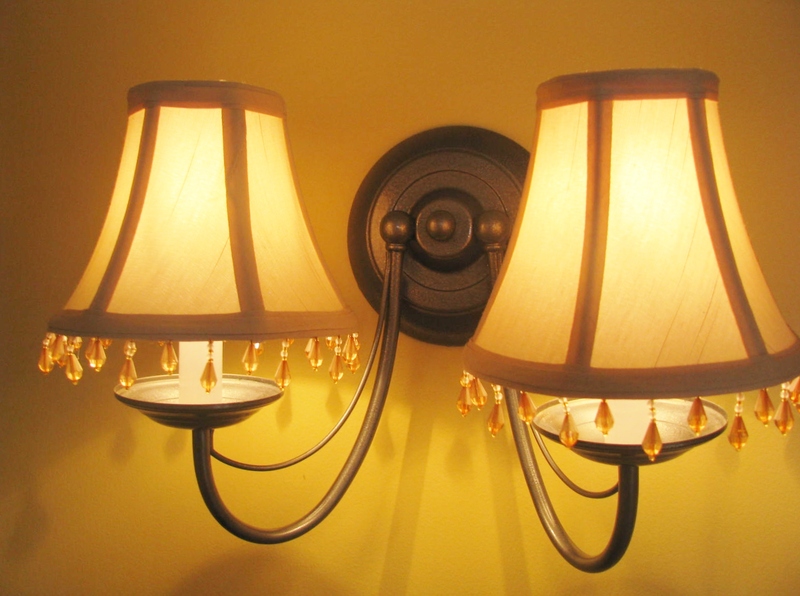 I used that time to get rid of the builder-grade, brass (ugly) light fixtures in the dining room. 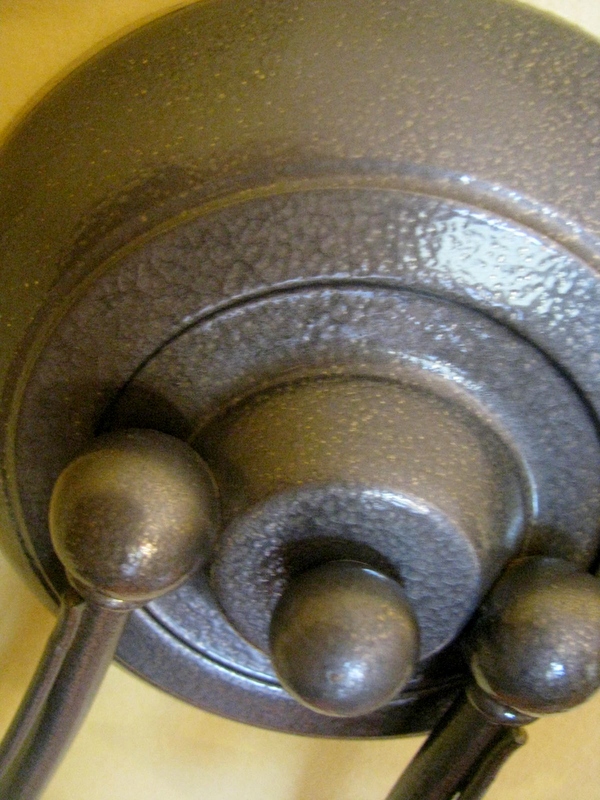 These are not antique brass fixtures. These are the bright, shiny, new yellow-gold ones which are probably some sort of faux brass-colored metal. Did I mention they were ugly? See the picture below. Well, I didn’t actually get rid of them, I painted them. I had been putting the project off for a few reasons. First, I knew that I would have to take the fixtures down to paint them, and I don’t do things that involve electricity. In theory, I understand how it works, but it still scares me to touch bare wires that could potentially electrocute me. But I just couldn’t stand the brass any longer, so I flipped the switch and touched the wires. Second, I was afraid that MacGyver would growl at the idea of painting over the brass. Better to ask forgiveness than seek permission. I should have known better. It’s been two weeks since I painted the chandelier and two sconces, we eat in the dining room almost every night, and he hasn’t even noticed yet! Go me! 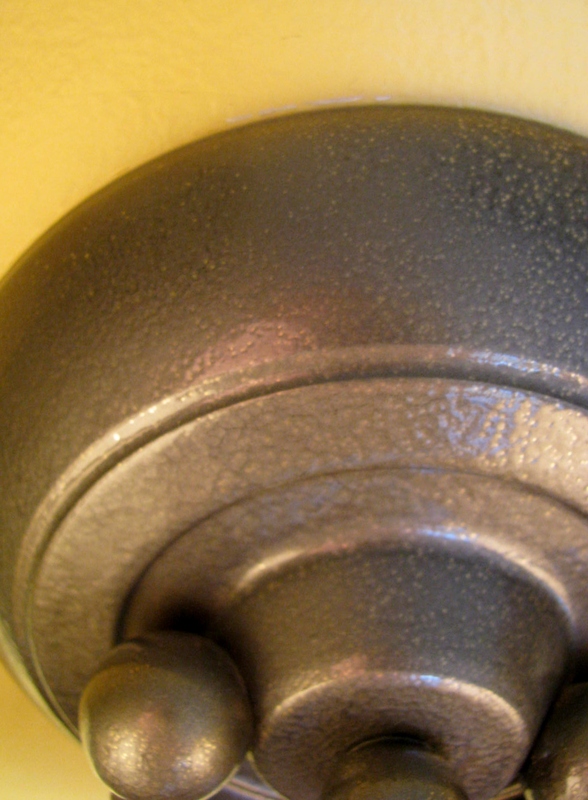 The paint that I used is Rust-Oleum’s Hammered Finish. It has a texture that is similar to hammered metal and is available in a few other colors. Super cheap. Super easy. And I like the results. Someday I’ll replace the fixtures, but for the time being, they are so much more attractive this way. Since he didn’t notice that I painted them, I wonder if MacGyver will notice when I replace them? Let me know what you think about the new paint finish. Do you like it?